There are thousands of recipes that use garlic. Most of our favorite garlic recipes make dishes that have fairly strong garlic flavor. The great thing about using garlic as an ingredient is that you can adjust the recipe to your liking by adding or reducing the amount of garlic that is called for. Garlic has several health benefits. Some studies suggest that eating garlic may help lower blood pressure and cholesterol levels. Garlic has been proven to be a natural non-targeted antibiotic. It is also high in antioxidants. 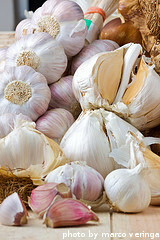 Garlic has been used for centuries as an aphrodisiac. It is a very versatile ingredient and can be left whole, chopped, diced, sliced, minced, pressed or crushed, depending on the garlic recipe. Boil water in a large pot to cook the pasta. Add 2 tablespoons of the olive oil and 2 tablespoons of the salt to the boiling water. Boil pasta for 7-9 minutes or until al dente. Drain pasta and set aside. In a large skillet, add butter and remaining 2 1/2 tablespoons olive oil. Melt together over medium heat. Add the garlic and saute for 30 seconds. Add white wine and bring to a boil. Add in shrimp, remaining teaspoon of salt and black pepper. Saute until shrimp turn pink. Remove skillet from heat and add parsley, basil, lemon zest, lemon juice and red pepper flakes. Toss ingredients together. Put the linguine back in the pot you cooked it in. Add the shrimp mixture and toss well until pasta is coated. Serve immediately. Cut bread in half lengthwise and place cut sides up on a baking sheet. In a small bowl, combine garlic, butter, basil, parsley, oregano and red pepper flakes. Mix together thoroughly and spread on each half of bread. Sprinkle mozzarella and Parmesan cheese evenly over each half of bread. Bake in oven for approximately 12 minutes, or until cheese is melted and top of bread is golden brown. Slice and serve immediately. Cut the head of garlic in half crosswise. The root end should be on one half and the tip end should be on the other half. Place cut side up in a small baking dish and bake for 20-30 minutes, or until it becomes moderately soft. Remove from oven. Meanwhile, bring a large pot of water to boil. Peel potatoes and cut into similar sized chunks. Boil potatoes until tender. Drain and return to pot and turn off the heat. Leave uncovered for 5 minutes so that most of the moisture evaporates. Transfer potatoes to a large bowl and mash. You can use a potato ricer or mash them by hand. Squeeze out the roasted garlic cloves into the bowl of potatoes. Add butter, sour cream, salt, pepper and parsley to the bowl. Combine all ingredients thoroughly and serve immediately. Place the chicken in a roasting pan breast side up. In a small bowl, combine butter, garlic, rosemary, parsley, salt and pepper. Mix thoroughly. Using a knife, cut a small slit in the skin on each breast, thigh and leg. Stick your fingers into the slits and gently separate the skin from the meat. Using your hands, stuff the butter and garlic mixture in between the skin and meat. Cut the lemon in half. Cut one half of the lemon into thin slices. Place the slices under the skin. Place the remaining lemon half inside the chicken, along with the onions, carrots and celery. Rub additional salt and pepper as desired all over the skin of the chicken to taste. Turn the chicken over so that it is breast side down. Place in oven for 1 hour. Remove chicken from oven and turn it over so it is breast side up. Place back in oven and roast for an additional 20 minutes, or until skin is brown and crispy and a thermometer inserted into the thigh reads 170 degrees F. Remove from oven and cover with a tent of foil. Let the chicken rest for at least 15 minutes before cutting and serving. Squeeze as much liquid as possible out of the spinach. In a large bowl, combine spinach, sour cream, mayonnaise, soup mix, water chestnuts, onion, basil, parsley, cilantro and garlic. Mix thoroughly. In a small bowl, whisk together garlic, brown sugar, soy sauce, rice wine vinegar, cornstarch and broth. Set aside. In a large skillet, add the sesame oil and vegetable oil. Heat until the oil is very hot - almost smoking. To the skillet, add the broccoli, snow peas, carrots, bell pepper, mushrooms and green onions. Saute until vegetables are warmed through. Sprinkle salt and pepper over the shrimp. Using a spatula, move the vegetables to one side of the skillet. Pile the shrimp in the other side of the skillet and cook 1 minute. Flip the shrimp and pour the garlic sauce over the top of the vegetables and shrimp. Let sauce come to a boil and thicken. Toss everything together so that the sauce coats the vegetables and shrimp. The shrimp should be cooked by this time. Remove from heat and serve immediately over rice. We hope you enjoy these garlic recipes as much as our family has.